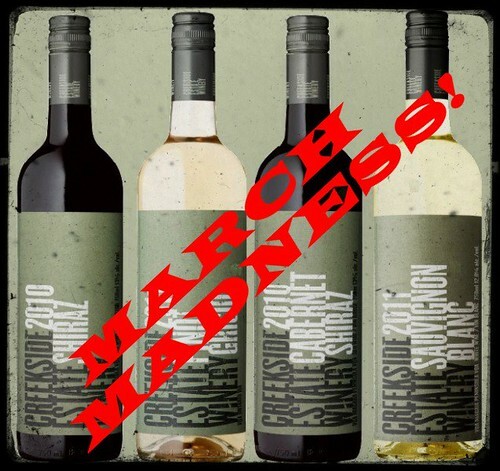 As March Madness approaches, not only south of the border but right here in Niagara at Creekside Estate Winery, crazy things take place. How about this for crazy? A new Undercurrent wine called Merazier made from Syrah, Merlot and … wait for it … drum roll … Viognier, all co-fermented and revealed at the winery’s March Madness event this Saturday and Sunday from 12-4. Creekside’s wine release weekends are always a hoot and the spring release features a bevy of Reserve wines about to hit the shelves. The tasting is $5 for non-Creek Freak members. 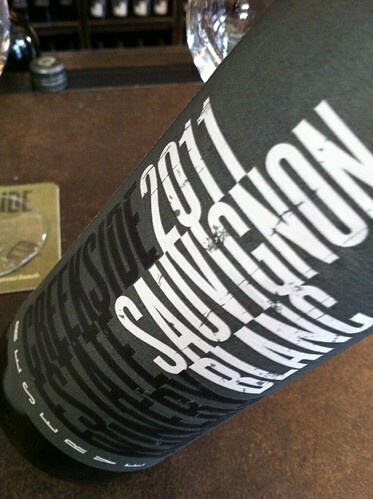 Creekside Reserve Sauvignon Blanc 2011 ($27, 89 points) — This wine spent 10 months in French oak, 60-70% of which is new. It’s a far different wine than the 2010 version, which was fleshy and tropical. This is fresher on the nose with lime zest, grapefruit and grassy-herbaceous notes that work well with the oak-inspired spices. It has good verve on the palate with zesty lime, pink grapefruit and grass flavours mingling with vanilla-toast and spice. Some aging potential here. Creekside Reserve Viognier 2011 ($30, 90 points) — The fruit comes from the estate’s Queenston Road Vineyard and only 80 cases were made. Not a lot of oak went into this wine with 75% of the fruit seeing seasoned barrels aging and 25% all stainless steel. I love the tropical fruits, melon, ripe apple and light nutmeg spice on the nose. It’s juicy on the palate with apple-pear flavours lifted by zesty lemon touches and intriguing spices. A delicious wine for near-term enjoyment. Creekside Undercurrent Merazier 2010 ($29, 91 points) — Creekside is famous for “finding” strays in the cellar — partial barrels of interesting concoctions that are just looking for a loving home. That’s why the Undercurrent series was invented. There wasn’t quite enough Syrah left over to make up a full barrel and another partial barrel of Merlot was discovered in a corner somewhere. Winemaker Rob Power decided to join them together in a 600-litre demi muid French oak barrel and add a little Viognier for good measure. The barrel was named Hitchcock and wine was named Merazier. The result is this rather big, aromatic wine with thick cherry-kirsch fruit on the nose with waves of cassis, black currants and spice following behind. It’s highly structured with a sturdy frame of ripe tannins and a wall of fruit that runs the gamut from juicy red fruits to bramble, currants, blackberry and an array of spices. Big and juicy, it needs time to merge all those moving parts. Chateau des Charmes Old Vines Riesling 2010, Niagara ($17, winery, 89 points) — The grapes were selected from vines that are 20-30 years old, the oldest sourced from the Paul Bosc Estate Vineyard. It shows a beautiful nose of ripe citrus, apple blossom, grapefruit, touches of ginger and flinty minerality and displays the ripeness of the vintage. It has good bite on the palate from fairly lively acidity and displays brilliantly the apple-citrus fruit, underlying spice note and crisp finish. Can age for three years or more. 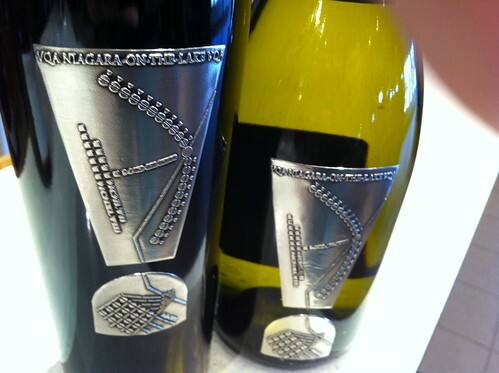 Chateau des Charmes St. Davids Bench Vineyard Aligoté 2011 ($14, LCBO and winery, 88 points) — From a single block in the estate’s St. Davids Bench Vineyard planted in 1991, in the shadow of the brow of the Niagara Escarpment, this rarely planted Burgundian white grape is a nice complement to its more popular cousin Chardonnay. The nose shows melon and fresh apple with a zesty-freshness through the core. The citrus, apple and melon flavours on the palate are boosted by wet stone minerality and crisp acidity. Delicious patio white for summer sipping. 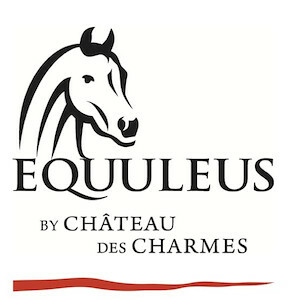 Chateau des Charmes Equuleus Paul Bosc Estate Vineyard 2010 ($40, winery, Vintages release April 13, 93 points) — I first tasted the components (50% Cabernet Sauvignon, 25% Cabernet Franc and 25% Merlot) for this winery’s flagship red blend in May of 2011. It had all the hallmarks of a beautiful thing way back then. Now that it’s bottled, and has a bit of bottle age, it’s true beauty is beginning to emerging. To rise to Equuleus status (it’s only made in warm vintages), each of the three grape varieties must achieve at least 23.5º Brix at harvest. It’s aged for one year in French Tronçais and Allier oak barrels. The nose shows layers of complex fruit and spice. Think kirsch, cassis, black and red currants, alluring cocoa and lavish spice. It’s dense and rich on the palate and built on a pillar of firm tannins. The smoky wood spices are joined by cassis, blackberry, cherry, earth, bramble and fine dark chocolate that is mouth-coating and caressing. All that goodness still needs time to fully evolve. Wait for it, it will pay big dividends. Note: The name Equuleus comes from the “Little Horse” constellation, best seen when it rises in the night sky every September, the traditional start of Chateau des Charmes’ harvest. This equine symbol celebrates Paul Bosc’s other passion — Egyptian Arabian horses which are stabled at the Paul Bosc Estate, the family’s home vineyard. EastDell Estates Gamay Noir 2010 ($13, LCBO, winery, 87 points) — Gamay in Niagara just keeps getting more popular and wineries are answering the bell with more and more being grown and produced. 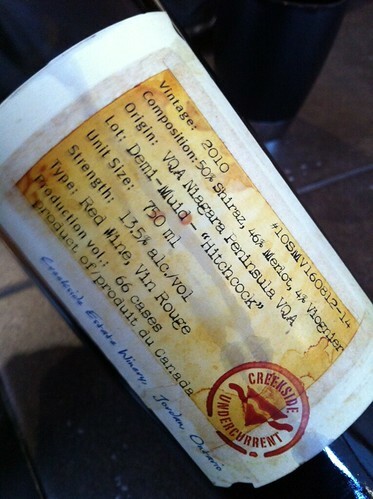 This is a smart buy from a good vintage for red wines in Niagara. The nose shows bright berry-cherry fruit on the nose with savoury spice and blueberry-plum accents. The fruits are ripe and juicy on the palate with a nice, balanced approach to the spice. Medium-body and soft tannins add to the appeal. Fresh Moscato 2012 ($12, winery only, 86 points) — This grape is finding favour around the world right now for its sweet flavours and fruity appeal. This one from Diamond Estates shows zesty citrus, peach, apple and floral notes on the nose. It’s sweet on the palate with peach, honey and all manner of summer fruits. Not a lot of acid, but enough that it’s not cloying in the mouth. Dan Aykroyd Discovery Series Sauvignon Blanc 2011 ($13, LCBO, winery, 86 points) — A grassy-lime nose with some grapefruit, gooseberry and grass notes. It’s a softer style SB on the palate with melon, grapefruit, and some tropical fruits. The herbs and grass notes are subtle through the finish. Pillitteri Chardonnay Musque 2011 ($20, winery, 88 points) — Fresh and ripe aromatics of tropical fruits, peach and apple. It’s clean and simply delicious on the palate with summer peach and apple flavours delivered in a fresh style. Great summer sipper. Pillitteri Exclamation Chardonnay 2011 (no price yet, release not announced, 89 points) — I had the pleasure of running into Pillitteri sommelier Allison Slute at the winery and she gave me a preview of some upcoming wines. I was impressed with the Exclamation Chard with its nose of quince, citrus, and integrated spice notes. Lovely texture in the mouth with green apple, pear and lemon-lime flavours that already taste seamless with the light oak spices. Can’t wait for the release. Pillitteri Exclamation Cabernet Sauvignon 2010 ($38, released later this spring, 90 points) — Simply gorgeous nose of plump and juicy dark fruits including blackberry, cassis and currants and all lifted by oak-inspired spices. The fruits follow to the palate with added wood smoke and spices and a fairly robust bed of tannins and decent acidity to balance it all out. Cab Sauv done right. 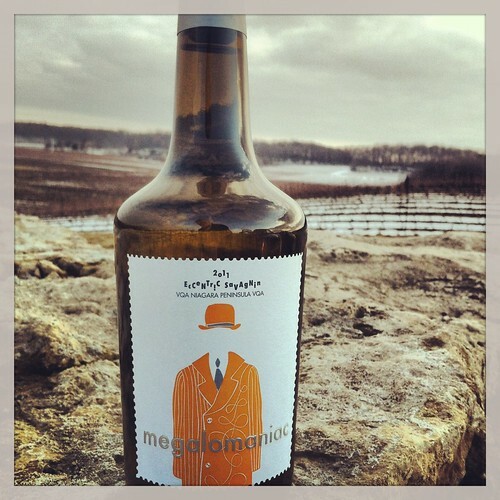 Megalomaniac Eccentric Savagnin 2011 ($25, winery, 90 points) — Savagnin is best known in the production of “Vin Jaune” wines in the Jura region of France and Mega owner John Howard even uses a similar bottle to those quirky wines. I adore this wine for its unique flavours. The nose displays grapefruit-lemon, creamy peach and pineapple and subtle smoke and toasted almonds. It’s quite delicious on the palate with ripe orchard fruits, a creamy texture and interesting jasmine, marzipan and nougat flavours all adding to the complexity of this white wine. Eccentric is the perfect name for this Savagnin.